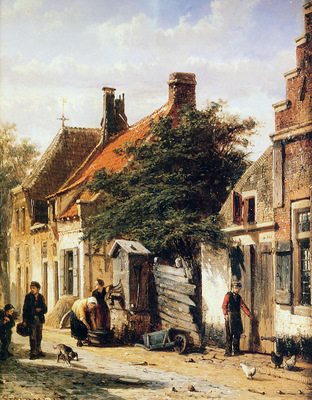 Cornelis Springer was born in Amsterdam May 25, 1817 as the fourth son of the carpenter-builder William Springer (1778-1857) and his wife Maria Elisabeth Doetzen (1777-1848). The Lutheran Springer family then lived at the address Spui 2-3, Boommarkt corner. Spot now in this century around the renovated premises of the Athenaeum Bookstore located so Springers birthplace in the original condition not to be found.